Incoming Call Information is a setting that determines how information is sent to you when you receive your incoming calls. Follow the steps to edit an extension’s call information. Click Users and select the User you want to make changes on. Select Settings and click Edit under Incoming Call Information. Set the Incoming number displayed to you as an Incoming Caller ID or Called number – When you receive a forwarded call from your AT&T Office@Hand account, you can choose what appears on your phone. Called Number will display the phone number the person dialed. If you use your phone for personal use as well, it allows you to identify business calls and answer them appropriately. The Caller ID option displays the phone number of the person calling. You can also add numbers before (pre-pended) or after (post-pended) the incoming number to help you identify the call. Note: Some carriers do not support the ability to send caller ID with pre-pended, or postpended digits. Please test that this functionality is supported by the appropriate carrier device the call will be sent to. 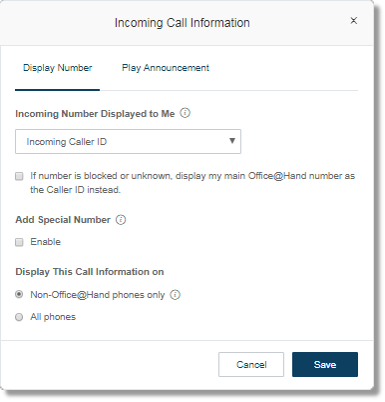 Set the display the call information on Non-Office@Hand phones only or All Phones – Select Non-Office@Hand phones only to display altered caller id on calls forwarded to your non-Office@Hand phones while still showing normal caller id on Office@Hand phones/IP phones. Select All phones to have the above caller id settings apply to any phone you receive calls at. Play announcement before connecting Direct calls – This option allows you to hear an announcement when your extension or phone is called directly. This is helpful for identifying how you should answer the phone, especially if you use the phone for both business and personal use. The Non-Office@Hand phones only option will play the announcement when forwarding a call to your home or mobile phone, but not when forwarding to an Office@Hand desk phone. 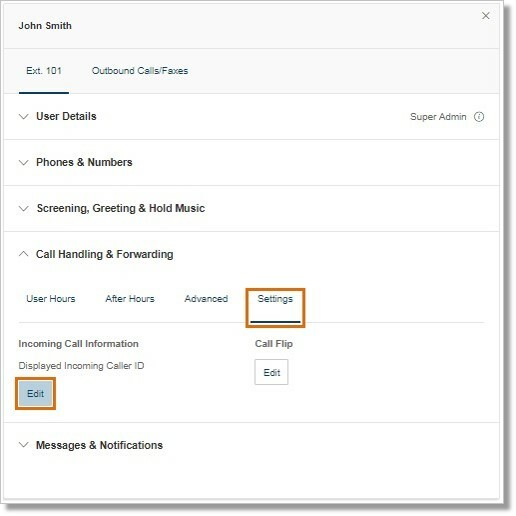 Call Queue calls – This setting applies if you are a member of a call queue. This is helpful for identifying how you should answer the phone, especially if you are a member of multiple call queues. The Non-Office@Hand phones only option will play the announcement when forwarding a call to your home or mobile phone, but not when forwarding to an Office@Hand desk phone. Require my pin to answer – This option requires the pin be entered before accepting a call. This is very helpful if you do not want other people to accept your calls, such as when you have a home office and do not want your children to answer business calls.